Notes: Though I don't approve of all of his ideas, I have always found Eco to be a genius of a writer, so it is with some relish I turn to this novel of his based during the Middle Ages. 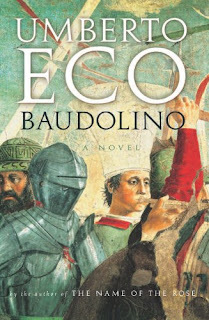 Mini review: Here Umberto Eco has created something of a Forrest Gump character in the 12th Century, though the Baudolino character is no simpleton, having decent intelligence and a little rogue within him. In fact, Baudolino is an admitted liar, so much so almost everything he says is a lie, but it always come with success for him, sometimes comically but often simply because those he has been surrounded by find his lies useful politically. Coming from a quaint background, Baudolino early on stumbles from one historic even to another while meeting important people, here being the shades of Forrest Gump, but unlike Gump, Baudolino eventually finds himself taken in by perhaps the most important political figure of the day, at least within Europe. The first three-fifths of this novel are basically historical, but then it veers over into myth for a long while, and here I lost much interest, mainly because it did not fit with the rest of the book and seemed more than a little unbelievable. Most of this novel is Baudolino telling his life's story to another, and since he is an admitted liar, it's difficult to swallow the mythological portion of this book because it seems it simply can't be true, though Baudolino himself does act as if the events were true and even seems to believe it. Towards the end, the book gets back on a historical footing, and even has something of a melancholy finish. Like many of Eco's work, here one will find plenty of myth and occult references, especially pertaining to the Medieval period. Think the Holy Grail, Prester John, ikons, relics and the like, and you'll have an idea of what I'm talking about. These elements do play various roles within the story, sometimes important and sometimes not, but they are related to a central mystery in this novel, a mystery that is of course unveiled at the end, though to me it felt rather anti-climatic mostly because the mystery itself had been brushed aside for long periods of this book. A good book, and fans of Eco will enjoy it, as should those with interests in Medieval history and myth.